Brilliantly fast and elegant, the 720S and 600LT Spiders are the pinnacle of supercar desire. The question of coupe or convertible often leads to a heated debate between automotive enthusiasts. Coupe lovers cite reduced weight, increased structural rigidity, and a lower price tag as reasons to forgo the folding roof. 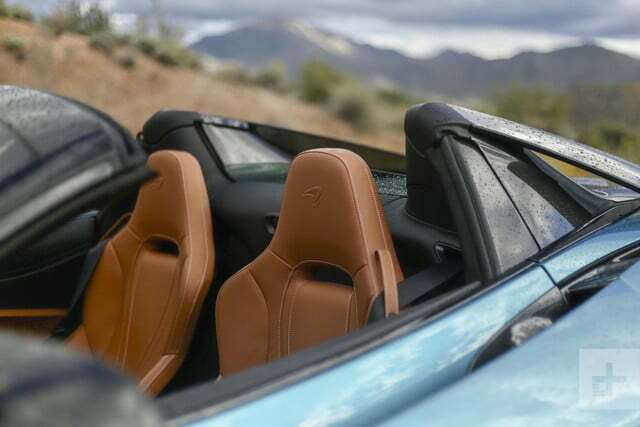 Convertible fans counter with the joys of open-element motoring and the style of a drop-top. Hope for a truce between both camps seems foolish – unless you’re McLaren. The British supercar manufacturer enjoys breaking from the norm. Before the foundation of McLaren Automotive – the current car-making entity – the F1 became the first road car to use a chassis made entirely from carbon fiber. The vehicle’s astounding power-to-weight ratio helped it set a top speed record that stood for seven years. Though McLaren never developed the F1 for racing, customer demand prompted the automaker to develop a GTR model in 1995. That car would win the 24 Hours of Le Mans the same year, making McLaren the first and only manufacturer to win the famous endurance race on its first attempt. Further refinement of the F1 eventually gave birth to the GTR ‘Longtail’ – an aerodynamically superior racer that took first and second place in the 1997 24 Hours of Le Mans race. A neat bit of history, but what does it have to do with the coupe versus convertible debate? The same innovative engineering principles that made the F1 road and race cars so successful have been applied to the company’s recent offerings, distinguishing them within the supercar market. 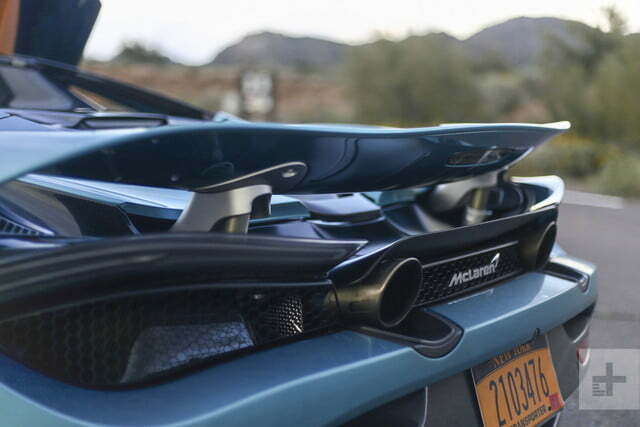 When developing convertible models, McLaren targets the same performance, design, and functionality benchmarks of its coupes, thus building something of a bridge between coupe and convertible foes. 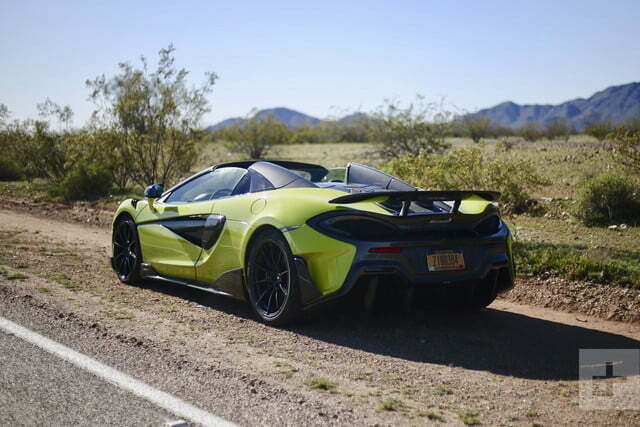 To see how disruptive McLaren drop-tops have become, we ventured to Phoenix, AZ, where the new 600LT Spider ($256,500) and 720S Spider ($315,000) await a test on road and track. Though the 600LT Spider is decidedly more track-focused than the 720S Spider, both vehicles are styled to accommodate their performance, rather than the other way around. As the most aggressive version of McLaren’s Sport Series (570 nomenclature) and a member of the iconic longtail (LT) line, the 600LT Spider is a longer, wider, more imposing vision of performance. 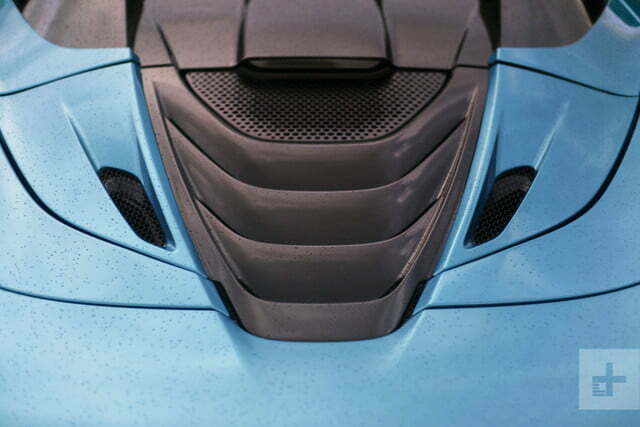 Like the 600LT Coupe, the Spider features an extended front splitter, large side intakes, jutting side skirts, optional aero winglets within the front wheel arches, a fixed rear wing, and a massive rear diffuser – all made from carbon fiber. 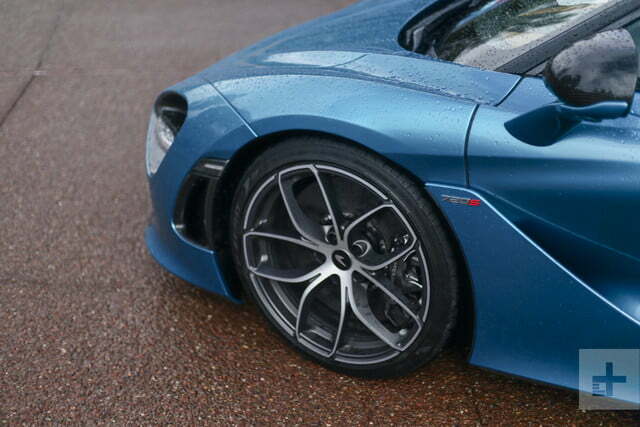 Thankfully, the transition from fixed to folding roof hasn’t robbed the 600LT Spider of its wicked top-exit exhausts, but the Coupe’s C-pillar buttresses are left off the Spider’s tall, integrated roll bars. Fluid and striking, the aero-optimized the 720S Spider turns heads as if it were floating three feet above the ground. We wouldn’t be quick to call the 600LT Spider beautiful – its menacing bodywork seems better suited to the Coupe and the 570S Spider is more elegant with its roof stowed. Still, certain colors (like lime green) give us the proper supercar goose bumps. Contrasted with the Lamborghini Huracan Performante Spyder, the 600LT Spider has the advantage of dihedral doors (Lambo omits its famous scissor doors on convertible Huracans), but is less jaw dropping in motion. 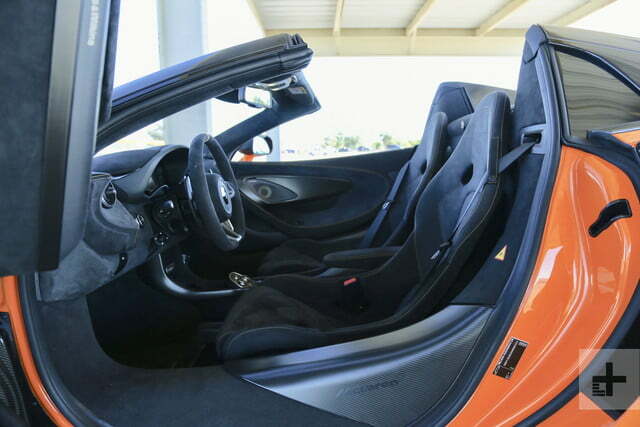 Inside, the 600LT Spider is a subtler affair. 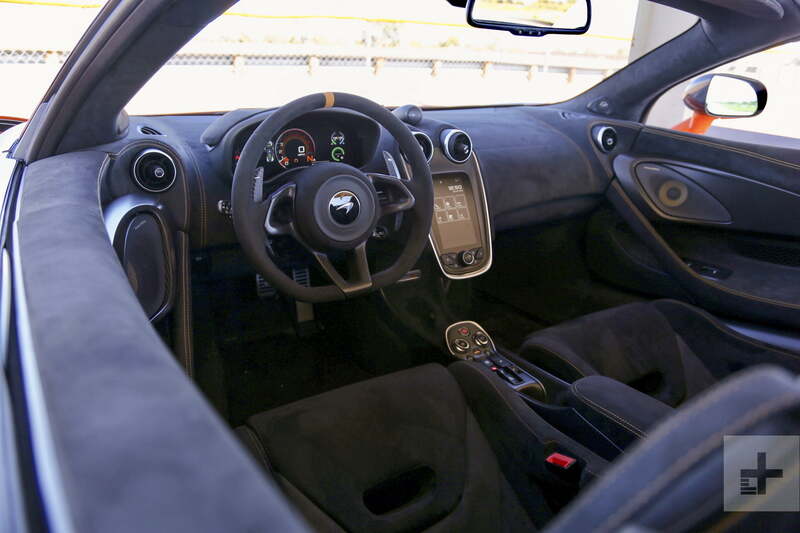 Black Alcantara covers the McLaren P1-derived seats, steering wheel, center console, doors, and dashboard. 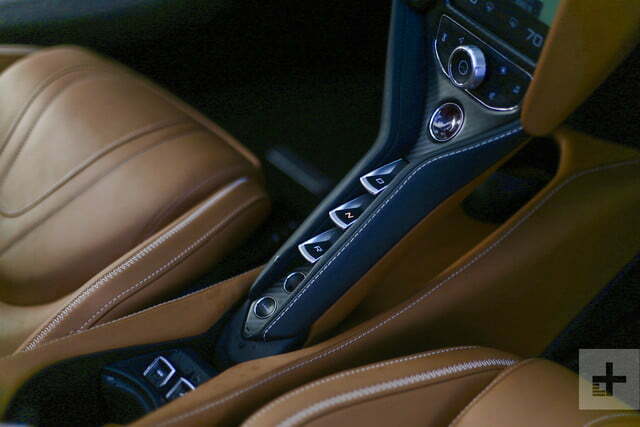 Body color-matching stitching and accents add a tinge of contrast to the dark cabin, as does the brushed metal trim on the center stack and air vents. The car’s accommodations are neither the most comfortable nor the most captivating, but the Ferrari 488 Pista Spider and Huracan Performante Spyder charge significantly more for their flourishes. 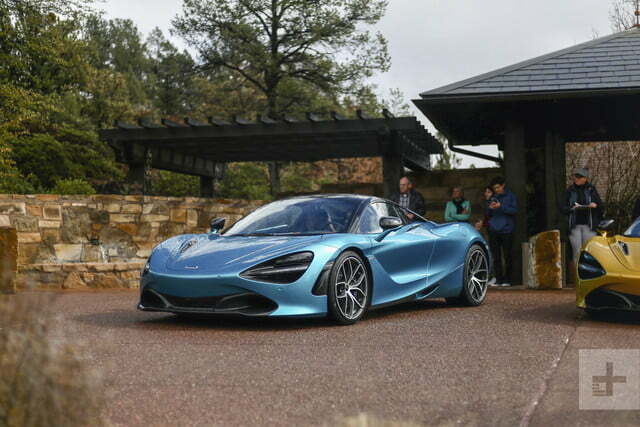 The 720S Spider, however, deserves all kinds of aesthetic commendation. Fluid and striking, the aero-optimized supercar turns heads as if it were floating three feet above the ground. Gaping eyelets, glimmering wheels, deeply recessed sides, rounded hips, a teardrop cabin, thin LED taillights, and center-exit exhausts show zero design weaknesses. 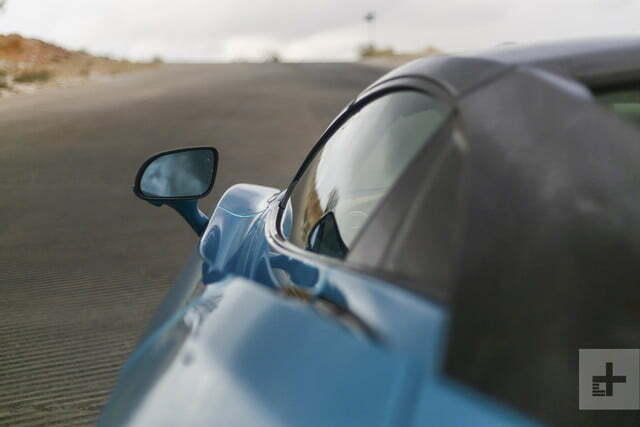 From all angles, the 720S Spider intoxicates. With the folding roof stowed behind passenger heads, the Spider is ever statelier. Fixed transparent buttresses guide the hooped roll bars to the engine cover, tracing the same beautiful line as the coupe. Paint color dramatically changes the 720S Spider’s visual punch, but even the loudest hues can do nothing to diminish its grace. We esteem the 720S Spider above both the Pista and Huracan roadsters as a fluid, bewitching design. 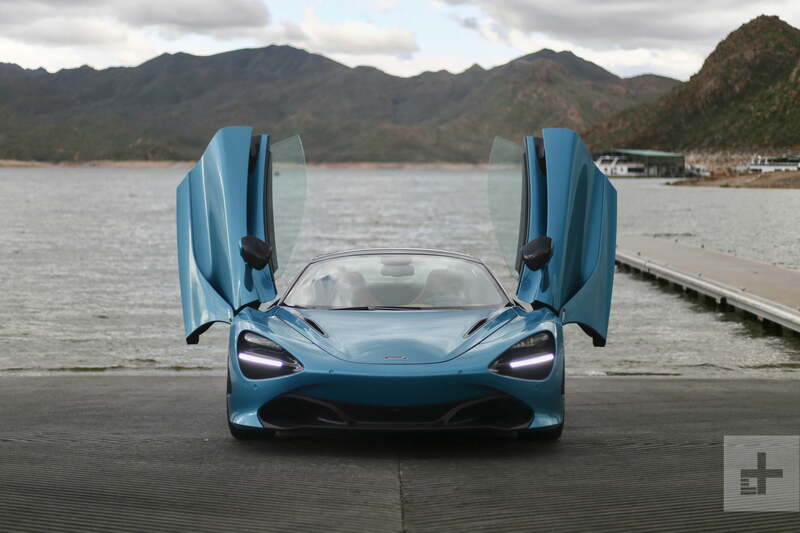 Extend the 720S Spider’s dihedral doors, descend (easily) into the cabin, and indulge in a blend of leather, carbon fiber, and other upscale materials. The car’s driver-focused cockpit can be optioned with duo-tone leather and contrast stitching, but even the standard configuration is a stimulus of shapes and controls. Tightly bolstered sport bucket seats are an ideal balance of support and comfort during our extensive drive along Phoenix’s surrounding highways and back roads. 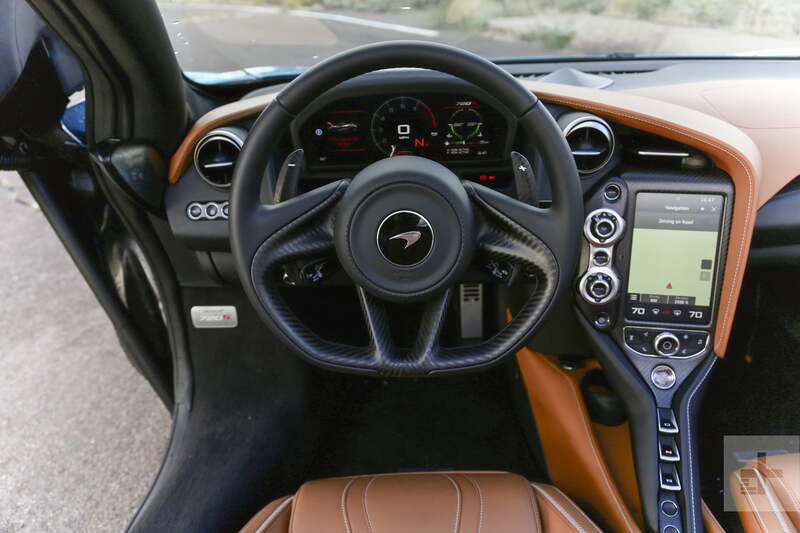 Interior technology matches each McLaren’s intended use, with the 600LT Spider getting by with older, less sophisticated gadgets, and the 720S making use of more contemporary tools. Within the 600LT, drivers find a reconfigurable digital display showing a centered tachometer and speedometer flanked by media and telemetry information. Integrated within the center stack is a 7.0-inch, vertically oriented touchscreen that controls navigation and climate settings. The center screen is somewhat frustrating to use, with sluggish responsiveness and outdated graphics. Lamborghini and Ferrari use more contemporary infotainments these days. The 720S cabin is an all-around upgrade, however, with sharper visuals and improved processing power. Like the 600LT, the 720S has a fully digital gauge cluster, but the Super Series model is distinguished by trick functionality. Choosing track mode tilts the display forward and pushes it back within the dashboard to reveal a thin monitor encompassing a horizontal tachometer, a speedometer, and a readout that tells the driver which gear the transmission is in. Child-like joy accompanies the screen’s transition, which of course means we perform the act numerous times during our drive. 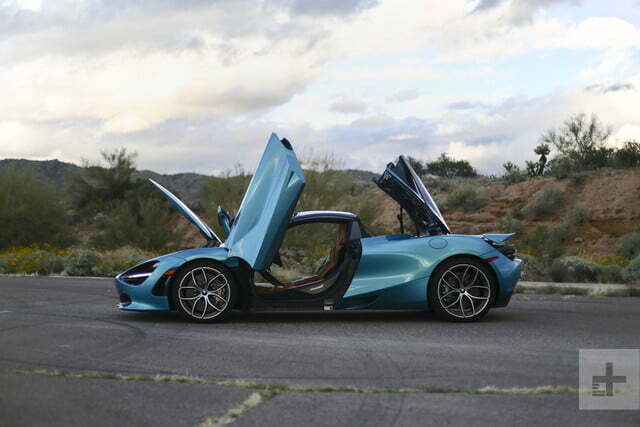 The 720S Spider effortlessly changes direction, confidently scrubs speed, and rapidly conjures speed. 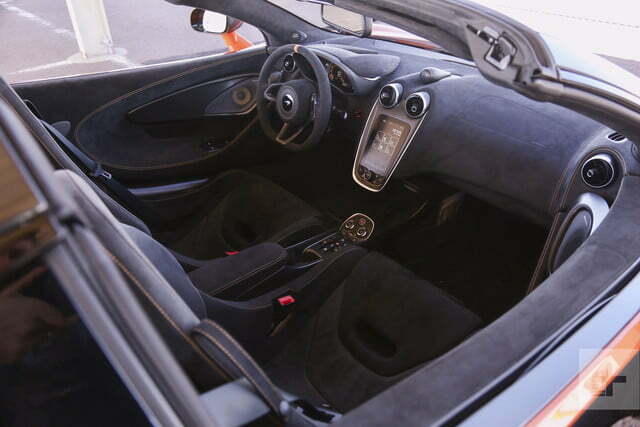 An iPad Mini-sized tablet sits flush within the 720S Spider’s center stack to control similar functions as the 600LT. Neither car’s infotainment accommodates Apple CarPlay nor Android Auto, and neither can be viewed through polarized sunglasses. When it comes to tech, Lamborghini does it better; it gave the Huracan Evo a brand-new infotainment designed in-house. An optional Bowers & Wilkins sound system is available to those who grow tired of twin-turbo V8 music (if there are such people). 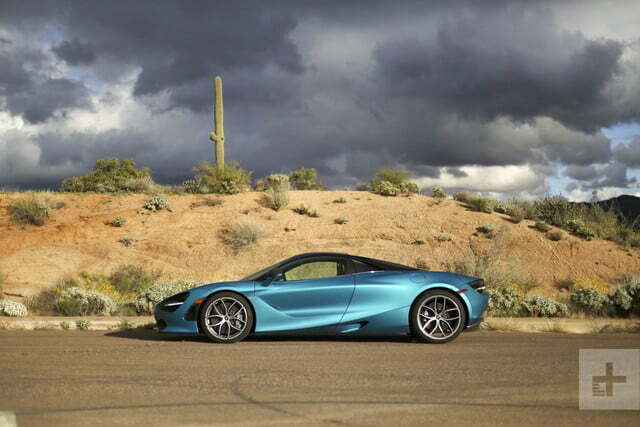 Defying its reputation for uninterrupted sunshine, Arizona’s skies weep upon the folding roof of our 720S Spider for all but a few intervals during our time behind the wheel. 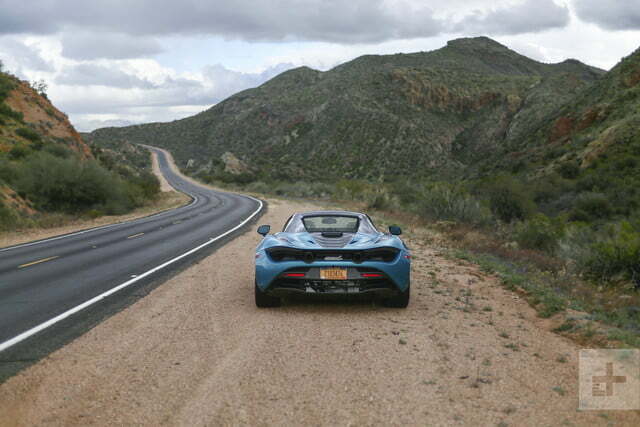 Such conditions do give us numerous opportunities to test the speed and silence of McLaren’s new convertible mechanism, which completes its cycle in just 11 seconds at speeds up to 31 mph. 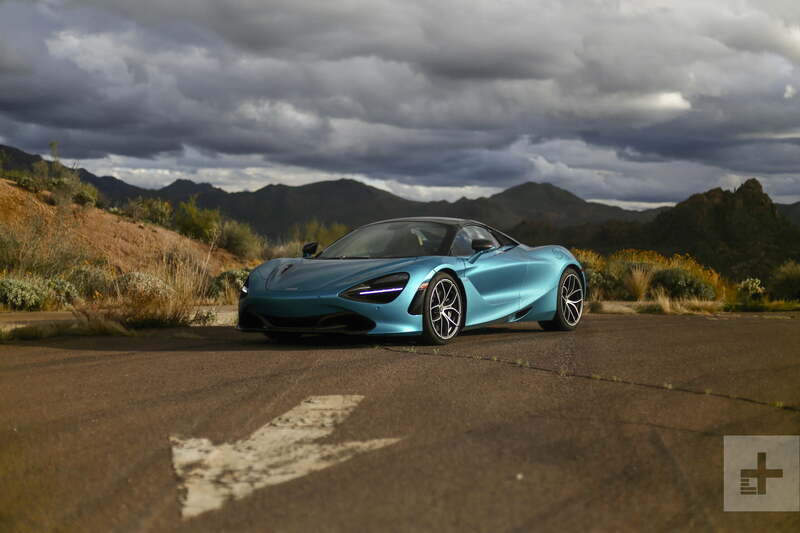 With the roof stowed and the rear glass raised, the 720S keeps wind buffeting to a minimum, allowing easy conversation between passengers and reception of the car’s sensational soundtrack. 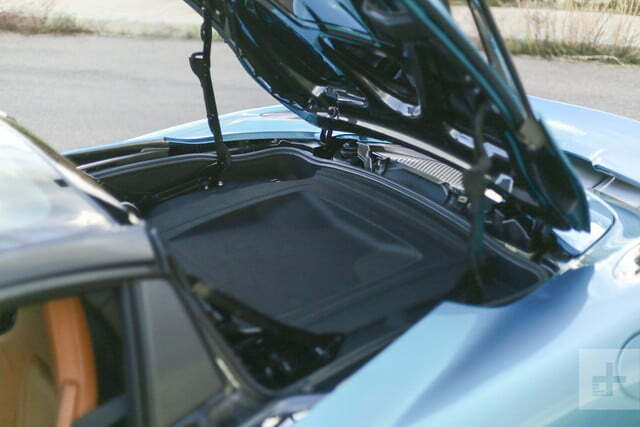 Roof fixed in place, the 720S Spider is as quiet and spacious as the coupe. A tweaked version of the 720S Coupe’s Monocage II carbon fiber chassis integrates a roll bar system and gives the Spider the same structural rigidity as the fixed roof variant. Nestled within this platform is a 4.0-liter, twin-turbocharged V8 good for 710 horsepower and 568 pound-feet of torque. 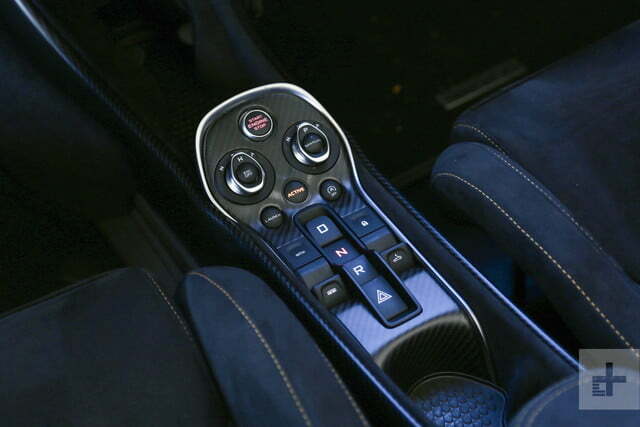 A seven-speed dual-clutch automatic gearbox sends power to the rear wheels. 0 to 60 mph is a coupe-matching 2.8 seconds and the run to 124 mph is just a tenth of a second slower, at 7.9 seconds. These figures are a bit difficult to comprehend, so let’s simply say that in the time it takes most small SUVs to build momentum for a highway lane change, the 720S Spider is already doubling the speed limit. 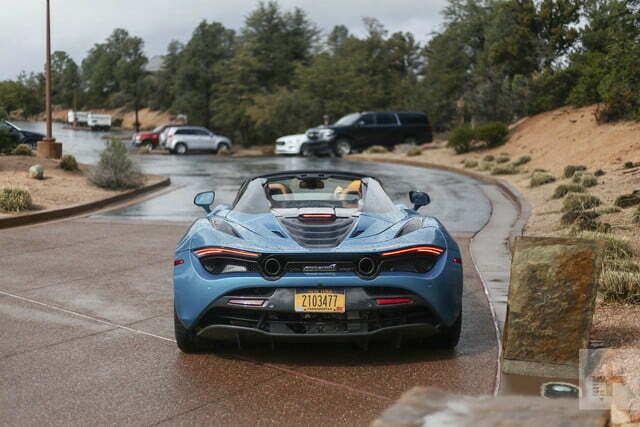 Wet roads and an abundance of Arizona officers keep most of our drive to modest speeds and maneuvers, but a late afternoon jaunt along a twisting, abandoned road shows the athleticism of McLaren’s middle child. Like our fond recollection of the Coupe, the 720S Spider effortlessly changes direction, confidently scrubs speed, and rapidly conjures speed. Much of the car’s dynamism is owed to its lightweight frame. 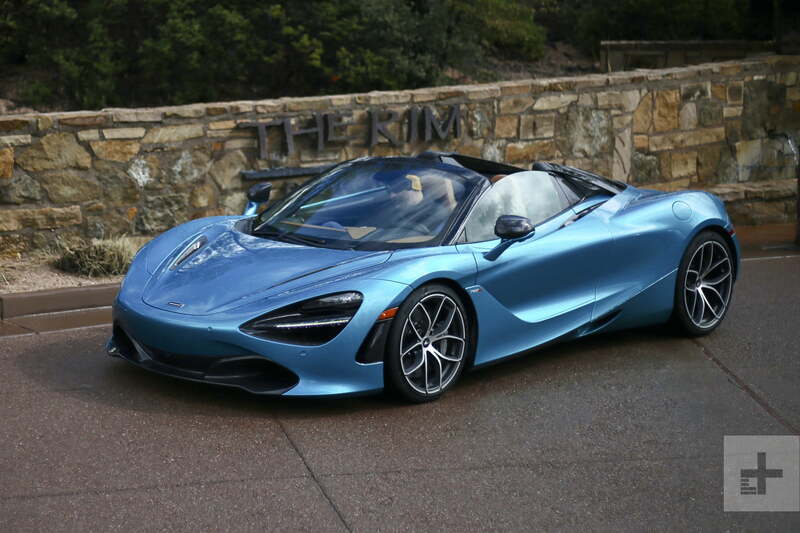 At 2,937 pounds, the 720S Spider is at least 100 pounds skinnier than its closest rivals. Competent suspension damping keeps the ride pleasant overall but the roughest roads and superb steering feel engages the driver on both sweeping and snaking corners. The 600LT Spider is perfectly suited to track duty, with just-right power, engaging dynamics, and – above all – a modular driving experience. At the dawn of our second drive day and our first go in the 600LT Spider, the weather is clear and chilly. While the sun makes its way higher in the sky, we sample the hard-edged McLaren with its roof in place. Decidedly more stiff than the 720S, but not appreciably more than the 570S, the 600LT Spider is happiest at speed and under G-load. Thankfully, the trek to Arizona Motorsports Park meets these conditions perfectly, giving us a taste of the car’s lofty limits. Utilizing a 3.8-liter twin-turbo V8, the 600LT produces 592 hp and 457 lb-ft of torque. Engage launch mode and the 600LT Spider matches the Coupe’s 2.8-second sprint to 60 mph. Keep accelerating and the hotheaded convertible hits 201 mph (with the roof in place). Like the 720S, the 600LT features a carbon fiber monocoque chassis with an integrated roll bar system to retain the Coupe’s rigidity. At just 2,859 pounds, the 600LT Spider is 220 pounds lighter than the 570S Spider and 174 pounds leaner than its closest competitor. With the track in sight, we lower the Spider’s roof – a task which takes 15 seconds at speeds beneath 25 mph – and prepare for some open-top hot laps. Our first few trips around 2.2-mile circuit are done in sport powertrain and handling modes, leaving traction control on high alert. As we learn the course, the 600LT Spider becomes more and more impressive. Turn in is immediate, the powertrain never seems out of breath, and the brakes are more than up to the challenge of slowing the lightweight supercar. Our next session shows us a completely different animal. With both powertrain and handling panels switched to track and the traction control independently adjusted to allow some slip, the 600LT Spider gets fierce. The hesitation of throttle input we’d experienced in sport mode is gone, allowing the Spider to use its aerodynamics and brake-based torque vectoring to put its power down. The brakes reveal even greater limits than we’d anticipated, allowing us to hit them later and later down the straights. Ample feedback through the steering wheel communicates the hairline limits of grip provided by the Pirelli Trofeo R tires. If not for the wind and sun invading the cabin, we would completely forget we are piloting a convertible. The 600LT Spider is perfectly suited to track duty, with just-right power, engaging dynamics, and – above all – a modular driving experience to make both novice and veteran drivers feel comfortable at speed. 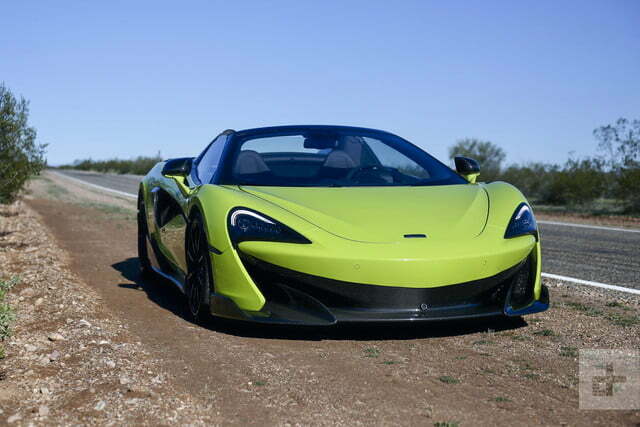 Coupe or convertible, McLaren has built an all-out weapon. Though distinct offerings in the supercar market, both the 600LT and 720S Spiders share some rivals. Lamborghini’s Huracan Performante Spyder ($309K) and Ferrari’s 488 Pista Spider ($374K) will be commonly cross-shopped with McLaren’s latest convertibles for their comparable performance, pedigree, and design. Wielding a 5.2-liter naturally aspirated V10, the Huracan Performante Spyder produces 630 hp and 443 lb-ft of torque. With its all-wheel drive system, 0-60 mph is dealt with in a scant 3.1 seconds and its top speed stands at 201 mph. Ferrari’s 488 Pista Spider counters with a 3.8-liter twin-turbo V8 making 710 hp and 568 lb-ft of torque. 0 to 60 mph takes only 2.8 seconds and top speed is 211 mph. In the war on weight, McLaren takes the win; both the 600LT and 720S Spider weigh less than these Italian foes. All new McLaren vehicles come with a three-year unlimited mileage warranty. Though supercar maintenance is more frequent and expensive, owners put far fewer miles on their cars than a more traditional vehicle. As such, McLaren’s “unlimited” mileage offer isn’t that wild of a proposition, and in fact matches up with Ferrari and Lamborghini’s new vehicle protection. Owners desiring additional coverage can choose an extended warranty for up to 12 years after purchase (bought in 12 or 24 month increments). Best of all, buyers can add this coverage at any time for a McLaren that’s less than 10 years old and has less than 100,000 miles on the odometer. Our perfect McLaren 720S Spider starts with a vibrant color scheme. 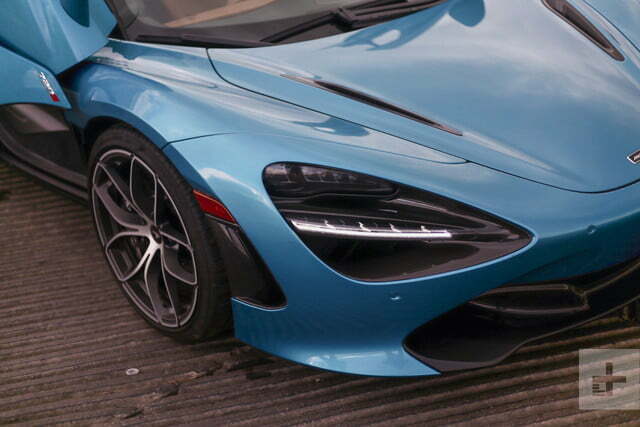 Based on the 720 Performance spec (which includes carbon fiber hood intakes, door mirror casings, and rear fender intakes, dark exterior trim, engine bay and interior ambient lighting, Alcantara and Nappa leather interior, and carbon fiber interior trim), we would paint the 720S Spider in McLaren Special Operations’ Belise blue. From here, add the five twin-spoke lightweight wheels finished in platinum, stainless steel sports exhaust, power adjust heated memory seats, front and rear parking sensors, a backup camera, Bowers & Wilkins 12-speaker sound system, and the hydraulic lift system. 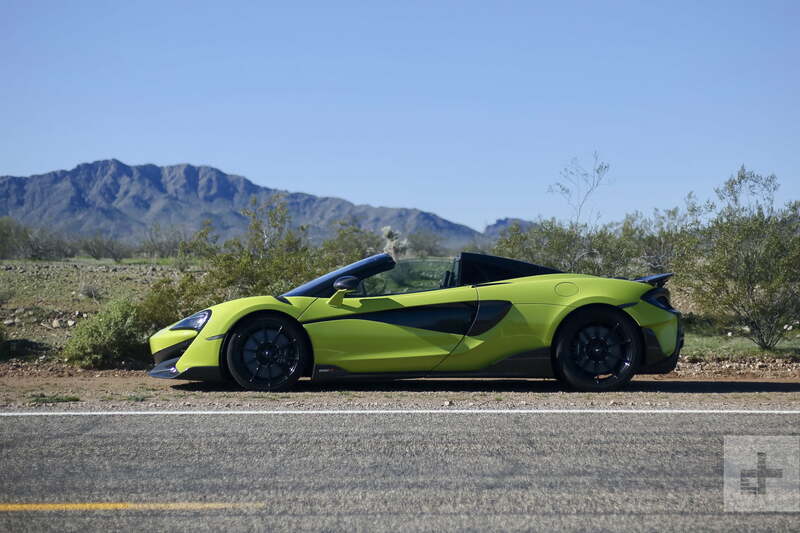 Switching over to the 600LT Spider configurator, we’d choose the bold lime green exterior on more subdued black painted 10-spoke lightweight wheels. 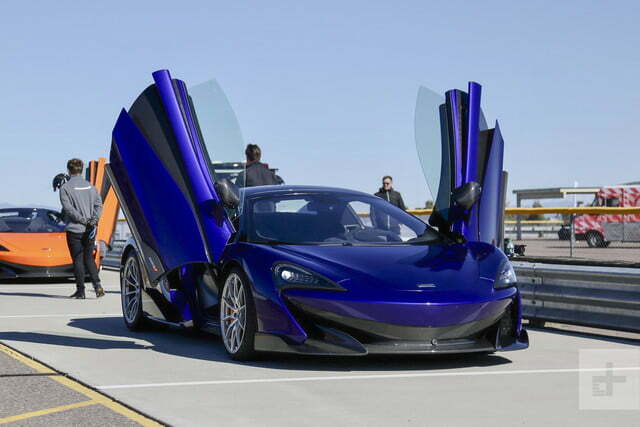 Other selections would include the MSO carbon fiber packs for added visual intrigue, soft-close doors, McLaren’s track telemetry system, and the vehicle lift. So, how much would these configurations cost? We don’t actually know. McLaren’s online configurators let you pick all the options, but one must contact a McLaren dealer to receive pricing details. 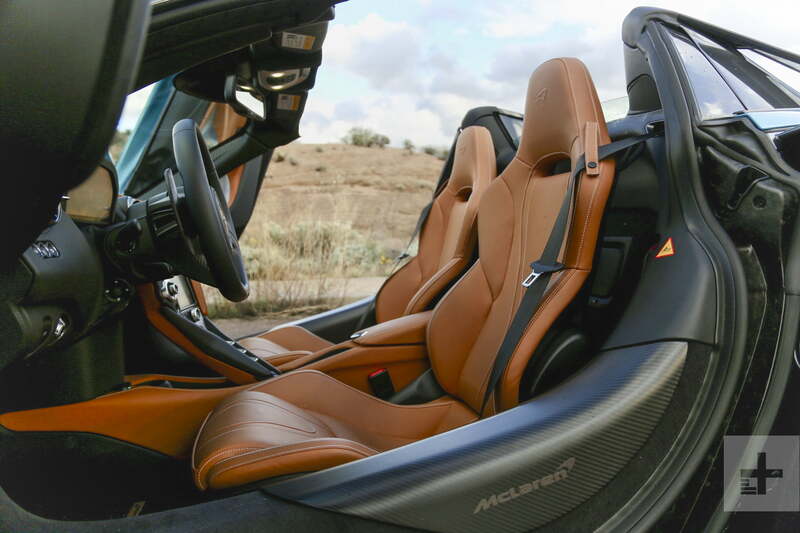 The convertible driving experience has always come at some expense to performance, and while other manufacturers have developed stylish, potent drop-top models, only McLaren has achieved harmony between coupe and convertible desires. The key, as it turns out, is obsessive weight reduction. 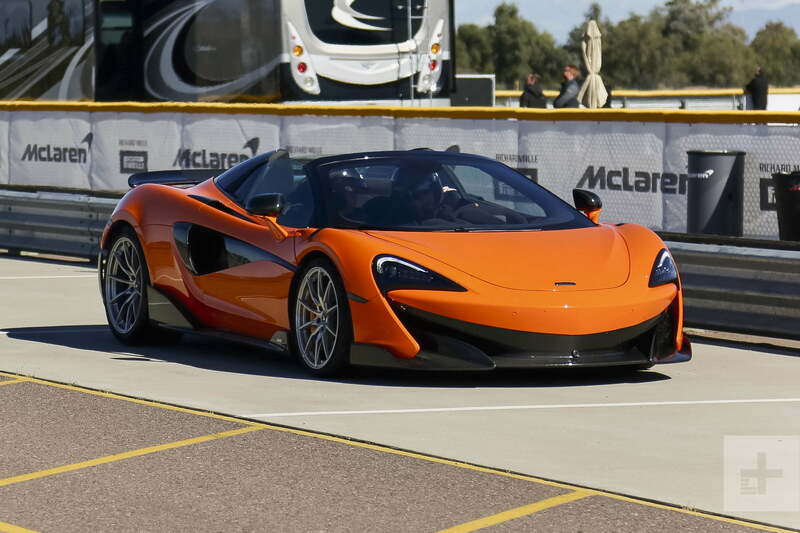 By focusing on lightweight, rigid construction, the same output between coupe and convertible McLarens yields similar performance. Furthermore, advanced hard top convertible mechanisms with coupe-like silhouettes afford Spider drivers, in a way, a two-for-one road car (at a modest price premium). Within their respective segments, the 600LT Spider and 720S Spider seem to exist without compromise. Let the warring coupe and convertible clans chew on that.